The International Institute of Tropical Forestry is located at Jardín Botánico Sur, 1201 Calle Ceiba, San Juan, PR 00926-1119; 787.766.5335; visit their website. 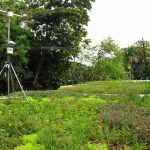 Watch the 2:45 International Institute of Tropical Forestry – Project of the Week 4/4/16 video from Greenroofs.com on the greenroofsTV channel on YouTube. Greenroofs.com Project of the Week video photo and graphic credits: David L Aponte, PRGD Inc.; Jeannette Rullán, RMA Architects; María M. Rivera Costa, Ariel E. Lugo, and Jeannette Rullán in “El Mensaje de Conservación de las Instalaciones Restauradas del Instituto Internacional de Dasonomía Tropical” RESEARCH NOTE IITF-RN-2 for the USDA; Peter M. Philippi of Skyland USA/rooflite; and 1939 Front Elevation by W. Ellis Groben. 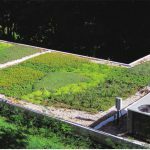 Learn about the following companies in The Greenroof & Greenwall Directory: Firestone Building Products; rooflite; ZinCo USA. The International Institute of Tropical Forestry – IITF (Instituto Internacional de Dasonomía Tropical) is a tropical forestry research and technology transfer institute and part of the United States Department of Agriculture (USDA) Forest Service. The Institute serves as a focal point for bringing external research and educational resources to bear on issues affecting tropical forests and grasslands. Located in Río Piedras, Puerto Rico adjacent to the San Juan Botanical Garden, it has a long and productive history. William Ellis (W. Ellis) Groben, a Forestry Service architect, designed the Institute in 1939, completed in 1942. Created in 1939 as the Tropical Forest Experiment Station in cooperation with the University of Puerto Rico, the Institute has been continuously in operation and is considered an icon for tropical forestry research. The mission of the International Institute of Tropical Forestry is to develop and disseminate scientifically-based knowledge that contributes to the conservation of forests, wildlife, and watersheds of the American Tropics. The Institute accomplishes its mission by developing and disseminating knowledge of scientifically sound practices that contribute to sustainable management of forest resources including water and wildlife, the conservation of primary forests, and the rehabilitation of degraded lands. Recently the IITF completed the long restoration of its headquarters complex. With stormwater and urban heat island mitigation as goals, the LEED-Gold certified International Institute of Tropical Forestry has 50,000 square feet of modern, state-of-the-art facilities that service the scientific community of the Institute and its collaborators. The LEED Gold certification is unusual because of the historic nature of the building. 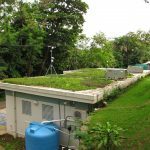 And because much was unknown of green roof performance in tropical climates, a Green Roof Research Station was planted. 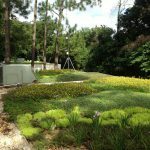 Its new design was meant to reduce the actual environmental footprint with a modern stormwater management system that incorporates green roofs, a green or pervious parking lot, rainwater harvesting, and retention ponds. 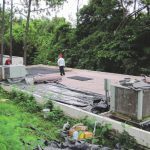 “The second phase of the IITF Headquarters Reform included remodeling of site facilities, and design of green roofs and rainwater harvesting for accessory buildings. The site work included replacement of asphalt parking with green pavement, that would provide pervious surface for water to filter into terrain and reduce heat island effect. Nevertheless, because terrain was found to have poor drainage capacity, it was also necessary to design a system of swales and detention ponds that would allow water to filtrate naturally with little or no runoff,” (RMA Architects and Engineers). 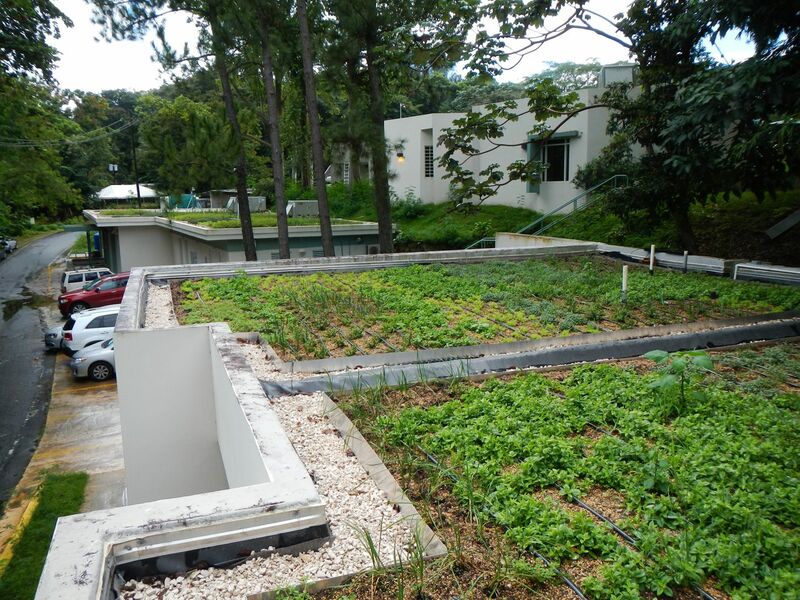 Based on the IITF’s long line of research projects, architect Jeannette Rullán from RMA Architects, green roof consultant David L. Aponte from PRGD, and USDA engineer Juan Vissepó designed the green roofs as an experimental intervention that would further the understanding in hydrological, thermal, and ecological behavior/benefits in a sub-tropical scenario. The IITF site has five buildings; green roofs were installed on four: the GIS and Remote Sensing Laboratory; Chemistry Laboratory Annex; Technology Transfer Conference Center; and a Multipurpose Building. 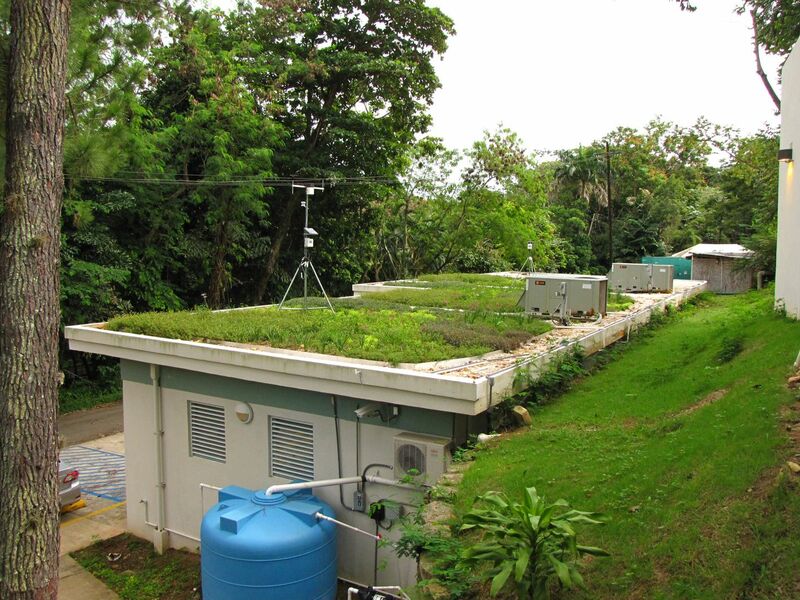 Prior to the green roofs, all of the IITF roofs were cool roofs, with the exception of the old Chemistry Lab and the main Institute building. 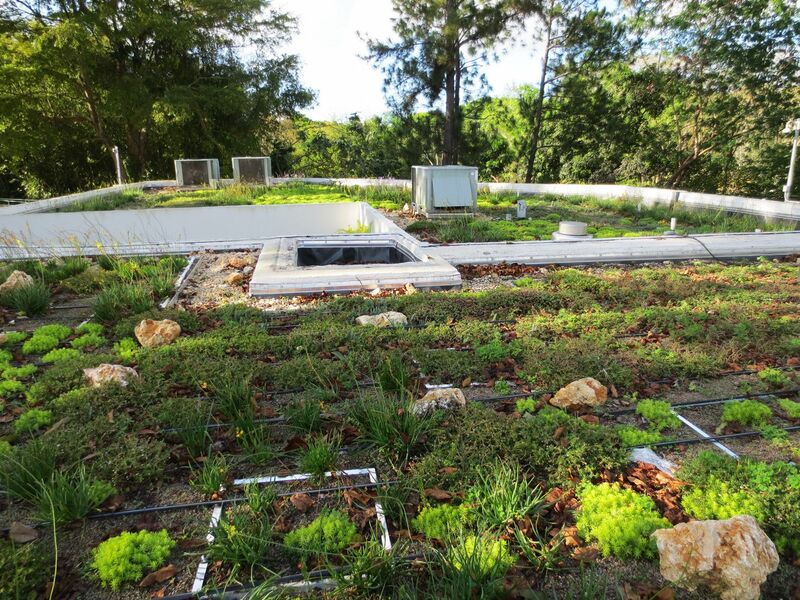 Therefore, all of the green roofs were constructed on top of cool roofs. The total green roof area is approximately 12,600 sqft. 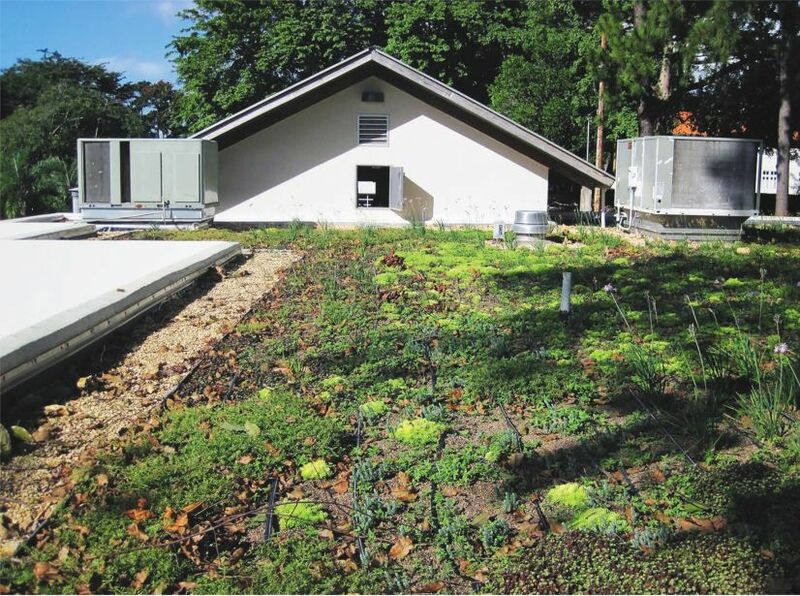 For the experiment, the GIS and Chemistry buildings were sub-divided into seven (7) separate green roofs and one (1) cool roof. 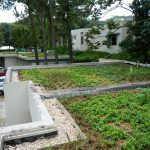 Soil depths were varied in each green roof sub-division (2″,3″, 4″, 5″, 6″, 8″, 10″). All sub-divisions are being monitored for thermal and stormwater behavior. 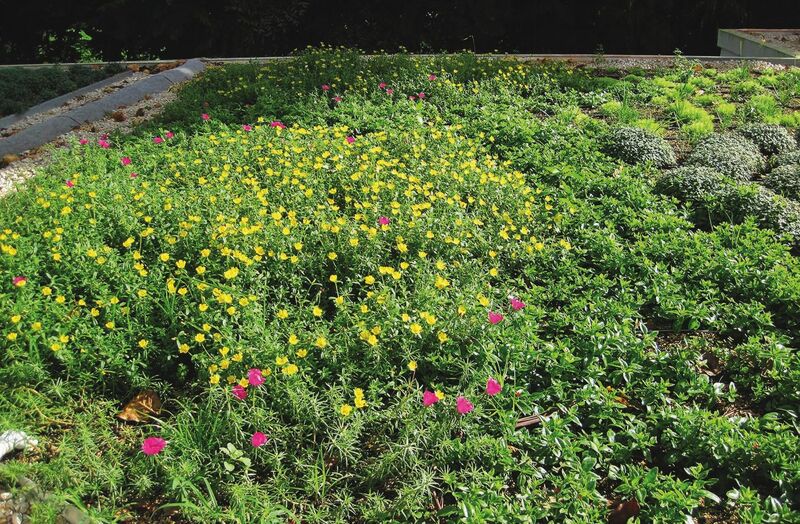 A Firestone 90 mil EPDM membrane was used to waterproof all green roofs. For the cool roof portion of the experiment, a white EPDM memebrane was used, and for the green roof portion a black colored EPDM was installed. 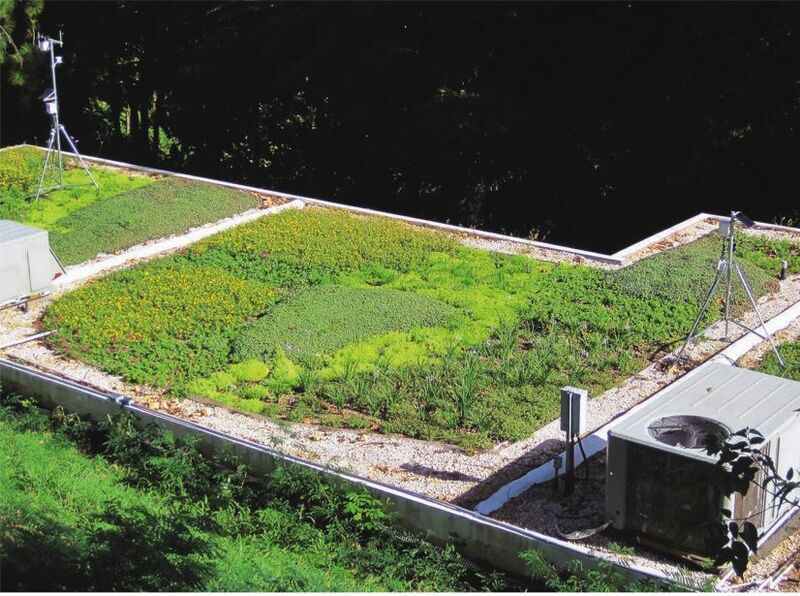 ZinCo’s green roof material was used in all four green roofs. 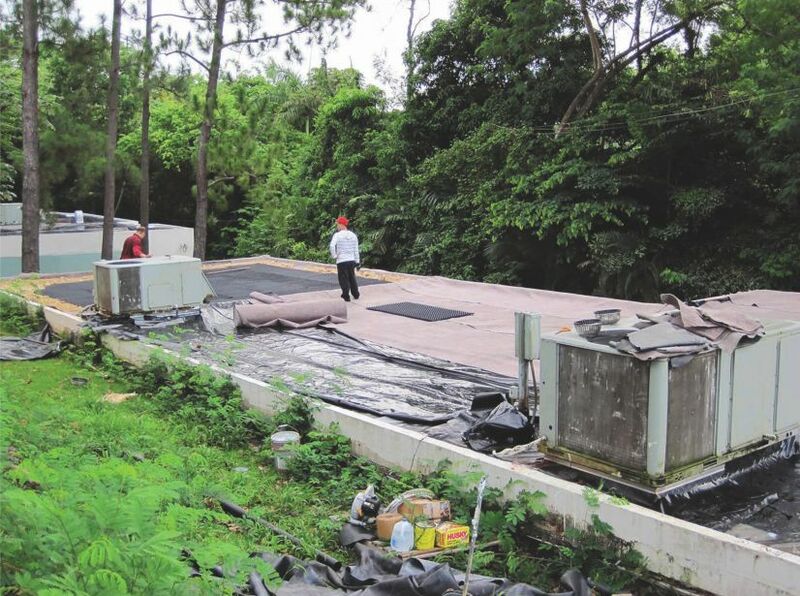 Their FD-40 system complied with stormwater requirements and with their proven track record in Puerto Rico, ZinCo was the best solution available. 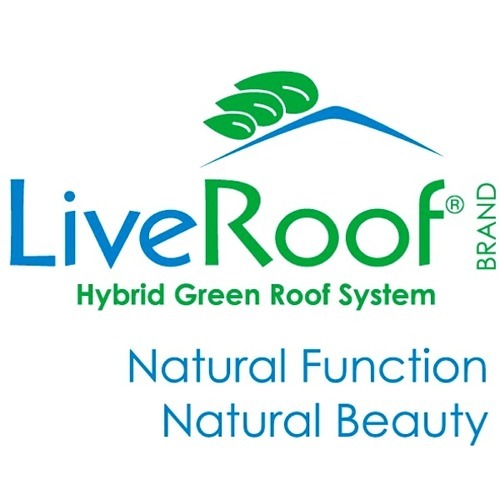 Rooflite extensive growing media was installed on all four green roofs. Depths vary depending on the sub-section. 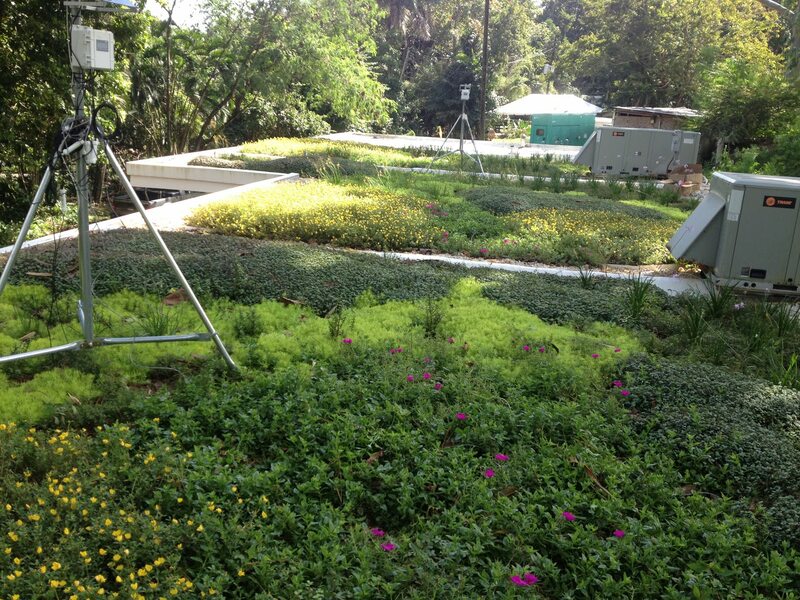 The plant selection was based on several years of data collection from different green roofs done by PRGD. A total of 22 species were used – around 16,000 plugs were installed on the project, with some seeds. 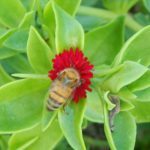 Growth has been rapid and many species bloom copiously, creating a beautiful multicolored carpet on the green roofs, and many insects and birds now visit or live here. Seeds from surrounding trees, in particular Spathodea campanulata (African tulip tree), eucaliptus, Leucaena leucocephala (lead tree) and Cecropia schreberiana (pumpwood) germinate abundantly and are removed during routine maintenance. 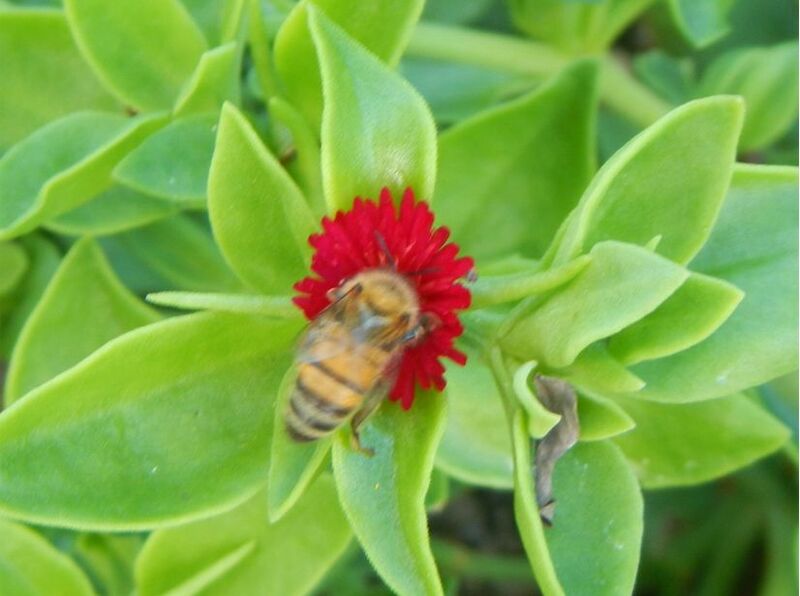 Vegetation was planted so that the IITF could investigate the effectiveness of individual species of plants and the plot where the process of natural dispersion of the species, its settlement, and growth determine the coverage. Located on the sides of the four test building sites, drainage directs flow from the roofs down to two cisterns of 2,400 gallons or two of 1,000 gallons (9,085 or 3,785 L, respectively) depending on the roof, for a total of four cisterns for stormwater harvesting. The total capacity for the four water storage tanks is 6,800 gallons (25.738 L) and when full they overflow to the vegetated swales and other features of the Green Parking Lot, designed as a model for stormwater features. Rainwater is used for vegetation and general cleaning, and an electric pump returns water to the green roofs when necessary. 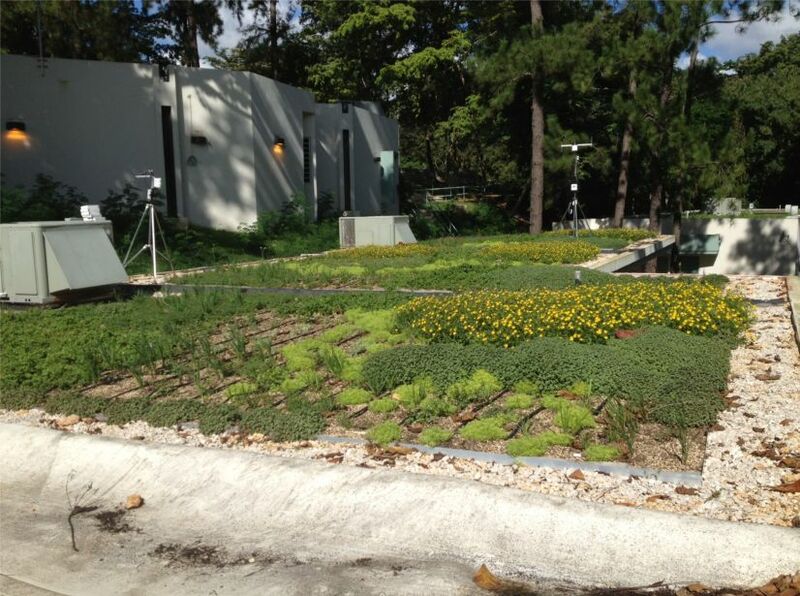 The monitoring scheme compiles the green roofs’ effectiveness regarding balances of energy, water, and nutrients. To achieve this goal, two Campbell weather stations were placed on the rooftops to monitor air temperature, humidity, wind speed, impact energy and rain. 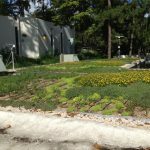 Hydrological and temperature sensors were placed on the ground surface, inside the volume of the soil, and the roof surface – on both cool and green roofs. In addition, a hydrological sensor was placed in the retention ponds just before draining into the swales in front of the Institute. A weather station has been in operation since 2002 located just below the drainage of the retention ponds. 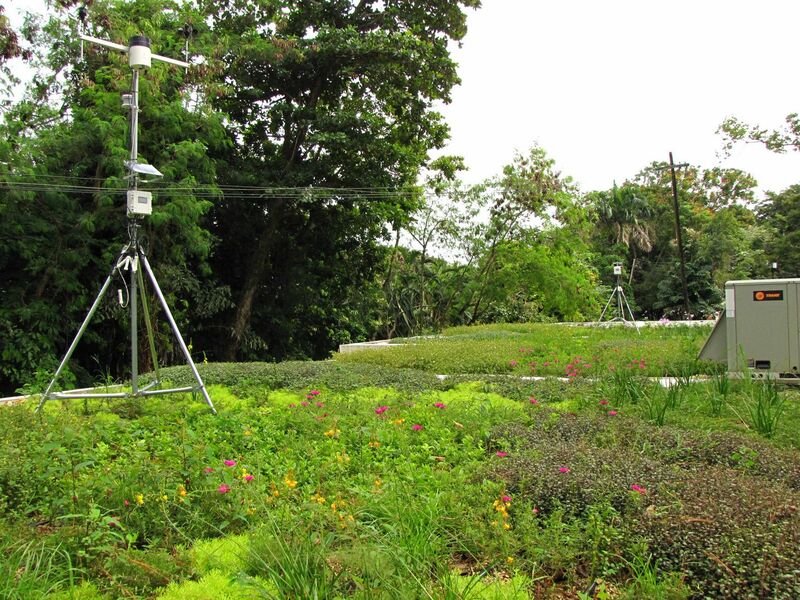 The design of the monitoring program includes 2 precipitation monitors, 13 temperature sensors, 7 humidity sensors 7, 1 sensor for wind speed and one for wind direction, 3 radiometers and heat flux sensor. All these sensors and weather stations (80 sensors in total) are connected to two Campbell data recorders programmed to read each sensor in real time. The sensor system measures seven parameters, which allows the IITF to describe the conditions under which plants grow. These conditions include air and soil temperature, air and soil moisture, the energy differential between the atmosphere, and the surface of the roof and the energy and water balance system. 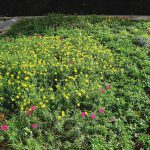 The temperature of the green roofs is always lower than the highest ambient temperature during the day and higher than the ambient temperature during the night. This is true even when the roof temperature is measured in surface soil. As the soil media depth increases, variation in daytime temperature is less variable, with small increases during the day. 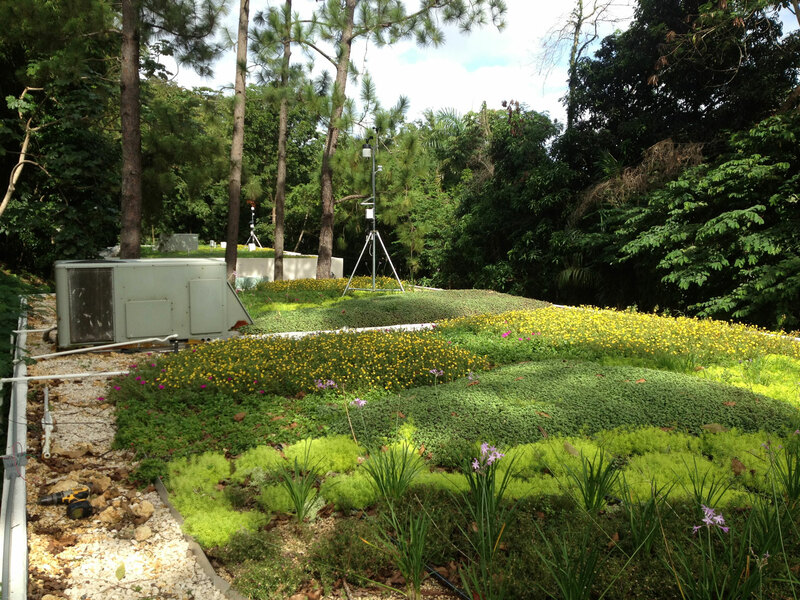 During the hottest times of the day, the green roof temperature is about 10° F cooler than ambient temperature. 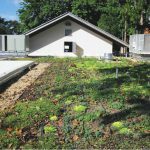 The differences in temperature between the green roof and ambient temperature mean less burden on the internal control of the temperature of the building and therefore result in energy savings. 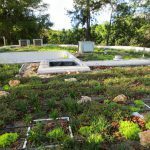 Green Roof Specialist: David L Aponte, President, PRGD Inc.